The concept of a “going concern” exemption for the purposes of the goods and services tax (GST) can still cause confusion when you sell your business. The GST exemption has its advantages — a buyer of a business does not have to find extra funds to cover the GST that is added to the purchase price. And while the buyer (if registered for GST) is entitled to get the tax back via the input tax credit system, this cannot happen until sometime after the completion of the transaction. It should also be remembered that while the GST will eventually be refunded, any stamp duty that is payable on the sale of a business will include the amount for GST. 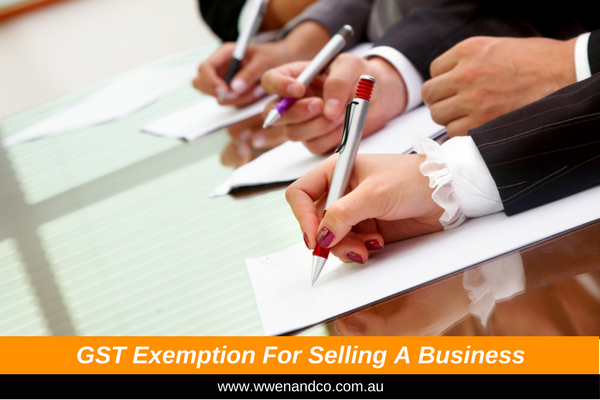 Business owners may be aware of the existence of a GST exemption but not completely understand the way it operates. the supplier and the recipient have agreed, in writing, that the supply is of a going concern. The Sale of Business contract will usually specify that the business (that is, the “supply”) is a going concern when the contracts are exchanged. This is critical because it shows that all parties to the sale acknowledge that the business is a going concern. A vendor is required to supply “all of the things that are necessary” for the continued operation of the enterprise. This does not mean everything that is owned by the business. It does, however, mean those things without which the enterprise could not function. Generally, this includes the necessary assets such as premises, plant and equipment and customer contracts. It can also include arrangements such as ongoing advertising. The tax liability risk (in case the ATO does not view the sale as a supply of a “going concern”) ultimately lies with the seller, as the seller is the “supplier” in any transaction that is required to remit GST to the ATO. Some vendors seek to avoid this tax liability risk related to the business by including a clause in the sale contract requiring the buyer to indemnify the vendor for any GST that may be payable in the event that the ATO does not view the transaction as one of a going concern.